You will be given a reference e-book to read which has 182 pages And the test will be based on that e-book , you can take final test within 1 year of purchase. What is Process Management Certification? Process management refers to the series of skills, tools and techniques used in controlling and managing the different business processes within a large organization or system. This type of management is extremely useful in productivity studies, systems engineering and business analysis. Its major objectives include clearly documenting and identifying the steps and actions that a process management team needs to undertake in order to successfully complete a workflow or process. It should also be noted that the process management approach requires one to first review and assess the performance of the existing business processes by reading operations manual, observing activities within the organization and communicating with the staff. This will allow you to realize that the actual business processes that are being carried out are different from the steps that are written in the manual or any other file. This is because of outdated manuals and the inability of the said manuals to realistically capture the steps and implications needed to carry out a business process. Anyone who desires to receive a process management certification should know that the entire process requires excellent skills in written communication and analysis. If you are one of the many people who desire to earn a process management certification, then you should remember that the entire process requires proper documentation of all the processes used within an organization, evaluation of the level of time and effort exerted by your staff and analysis of the bottlenecks, efficiency and the overall costs of carrying out the business processes. If you really have a strong desire to get a process management certification, then you should know that Brainmeasures is capable of providing you the best program. Its process management course aims to supply its participants with the right amount of knowledge regarding process management and how they can successfully carry out their functions as experts in the field. You have a hundred percent guarantee that Brainmeasures is capable of offering you the most reliable training because of the fact that it has already received its certification from ISO. This online certification program comes with a process management exam designed to evaluate your level of understanding and skills about process management. Brainmeasures will require you to pass this exam before you can receive your process management certificate. 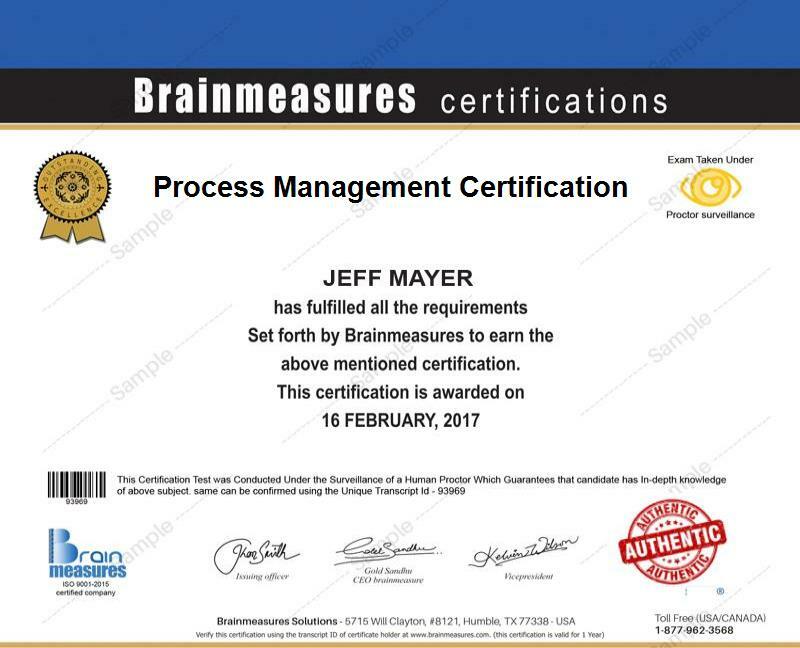 Brainmeasures makes it a point to develop its process management certification program in a way that it meets the demands of a wide array of individuals and professionals. You will also enjoy the fact that the company does not set any standards and qualifications when it comes to admitting interested participants in the program. The certification course can benefit a lot of professionals including IT and business executives whose responsibilities include those that are linked to business process management initiatives, business process owners, business and systems analyst and anyone who wishes to improve his knowledge and skills in managing and designing business processes. Salary for process management certification holders can be expected to be higher than what you have expected before you received your certificate. Indeed.com states that the average salary for certified process management experts is $93,000.